The Heating Plant, completed in 1864 and located behind Main Building, was among the first central heating plants constructed in America and probably unique in its incorporation of equipment for the generation and distribution of not only heat but gas to Main Building. Main, for a brief time the largest building in America, was not easy to heat and light, and Matthew Vassar took a persistent and personal interest in the plant's design and construction. The Boiler and Gas House covered 3,528 square feet, with three boilers, two benches of gas retorts (1), purifiers, and coal storage space. Fourteen miles of pipe carried steam heat across the campus and over twenty miles of pipe carried gas. All buildings on campus except for the Observatory (which had its own internal heating and lighting mechanisms) were served by the plant. As the college expanded its physical space, it also expanded its heating facility. In 1865, the plant produced 7,571 cubic feet of gas a day; by 1873, that supply increased to 15,053 cubic feet daily. 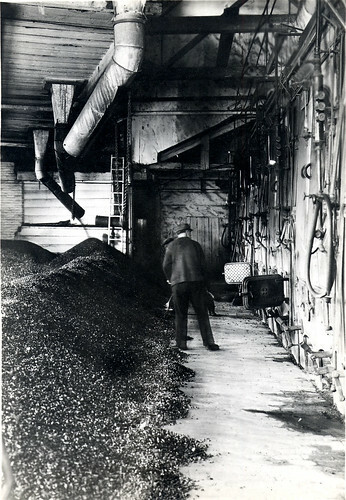 In 1876 the plant had four boilers, with a fifth reserved for emergency use, burning 1600 tons of coal a year. Gas was produced by six retorts. In 1902, the same year that Davison, the last quadrangle dormitory, was built, pockets for the storage of coal were added. A system of underground tunnels was used to force steam heat from building to building; showing foresight, Matthew Vassar had drawn preliminary plans for such tunnels in the early 1860s. In 1912, the college switched from gas to direct current, and a refurbished powerhouse was designed by Lord & Co. Additional coal bunkers were built in 1921. In 1955, after the college had been producing its own power for ninety years, the trustees decided to discontinue manufacturing power on campus and to begin to purchase alternating current from a local company. With several modifications and modernizations, the steam plant remains part of the college's energy system. In 1973 the former power house was transformed into the Powerhouse Theater by Robertson Ward Jr., and in 1994 the coal bunkers followed suit. The "coal pocket," as it had been called, was converted by Vassar's architecture instructor Jeh Johnson into the ALANA Center, which houses students of color organizations, and a black box theater for student dramatic groups, the Coal Bin Theater, later renamed the Susan Stein Shiva Theater. Elizabeth A. Daniels, Main to Mudd, and More. Poughkeepsie, NY, 1996. Benson Lossing, Historical Sketch of Vassar College. New York, 1876. John Raymond, "Re: The Shame of Vassar," Springfield Daily Examiner, 26 December 1873.